Mark’s Vacuum and Janitorial Supplies is more than a vacuum store! We are a full service Jan/San house, providing everyone from individuals to large corporations with the equipment, chemicals and the experience to fulfill their janitorial needs. With over 45 years of experience and nearly 30 years in business, we have the ability to provide the customer with the exact fit for their situation. 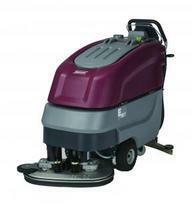 We offer high quality residential and commercial vacuums from Riccar ,Maytag, Sebo and Proteam. For our larger customers, equipment from Minuteman, Tennant, Advance, Clarke, Pulse-Bac, Cimex and many others.. Most importantly we service everything! For our commercial customers we carry a full line of janitorial equipment and chemicals by NCL, Misco and now, Sterns a great alternative to traditionally packaged chemicals, providing savings via inventory control and portioning. Please take a minute to look through our web site and learn more about us, then call, email or visit us with any questions you have. Thank you, from the Staff at Mark’s Vacuum.